Courtesy of BLEND, The Rendon. Amongst a flutter of art activity at the LA Art Show this week there’s a little bit of DTLA fun at The Rendon for a two day only pop-up. You may remember the last the two cutting edge art performances held at the Rendon: “Art at the Rendon: Hidden Rooms” and “Art at the Rendon: Stories.” The gallery has now gestated a new exhibition called BLEND and it officially debuts Friday, January 25, 2019. BLEND is part of an ongoing series of creative programming intended to expose new artistic talent in a receptive environment that offers full-bodied explorations and expressions of their art for the public. 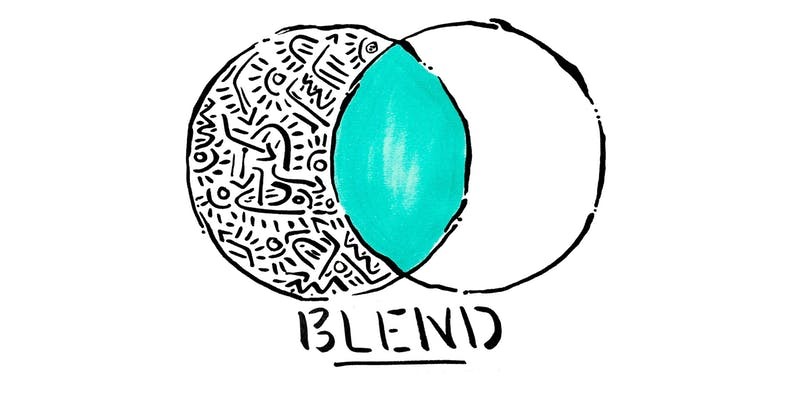 Along with KFISH Other collaborators with BLEND include Zachary Bennett-Brook, Kyle Boatwright, Armando Dela, Gabe Gault, Davia King, Colette Miller, Moncho 1929, Vero Villareal Sada, Tiaan Schreuder, Priscilla Carpenter Witte, Yanoe, Erin Yoshi, as well as Ziman. King, KFISH, and Boatwright have collaborated previously on a project for a resort in Nipton, California. Nipton has a growing reputation for supporting large-scale innovative art. The triad of artist beautifully painted these 3 vintage cars, that includes: a 1954 Plymouth Cranbrook painted by Boatwright, a 1959 Lincoln Continental Mark III painted by King and a 1964 Cadillac Fleetwood Limo painted by KFish. BLEND will feature these mobile canvases in the Rendon parking lot expanding the art outside of the building proper. It’s going to make for a more out-of-the-box gallery elevating art experience. BLEND is a continuation of the Art at the Rendon series with innovative and culturally significant engagement that challenges and elevates viewers experience of art. Friday, January 25, 2019, 6 p.m. – 10 p.m.
Saturday, January 26, 2019, 11 a.m. – 5 p.m.
Visit the The Rendon more information and for tickets visit their Eventbrite. This entry was posted in Art, Attractions, Events, Miscellanious and tagged Armando Dela, Art at the Rendon, BLEND, colette miller, Davia King, dtla arts district, Erin Yoshi, Gabe Gault, KFish, Kyle Boatwright, Maria Greenshields Ziman, Moncho 1929, Priscilla Carpenter Witte, Ralph Ziman, The Rendon, Tiaan Schreuder, Vero Villareal Sada, Yanoe, Zachary Bennett-Brook. Bookmark the permalink.